Ernest Nister (1842-1909) began his publishing career in 1885 when he acquired a lithographic workshop in Nürnberg and printed books for London publishers. In 1888 he became a publisher in his own right with offices at 24 St. Bride Street, London. He appointed the writer and editor, Robert Ellice Mack, as director. Nister specialised in high quality colour printing for children in the last quarter of the 19th century. Movable books with various mechanisms became his speciality after 1890 (when be published his first stand-up book) but he also produced numerous picture books, annuals, poetry, nursery rhymes, calendars and greetings cards. He worked with a core of writers, including Clifton Bingham and Robert Ellice Mack, and illustrators, in particular Eveline Lance, Harriett M. Bennett, Edith A. Cubitt and Rosa Petherick. 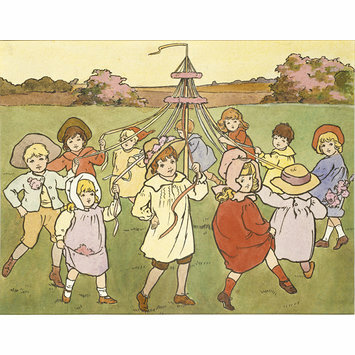 Pen and ink and watercolour drawing on stiff card of eleven children dancing anti-clockwise round a Maypole. 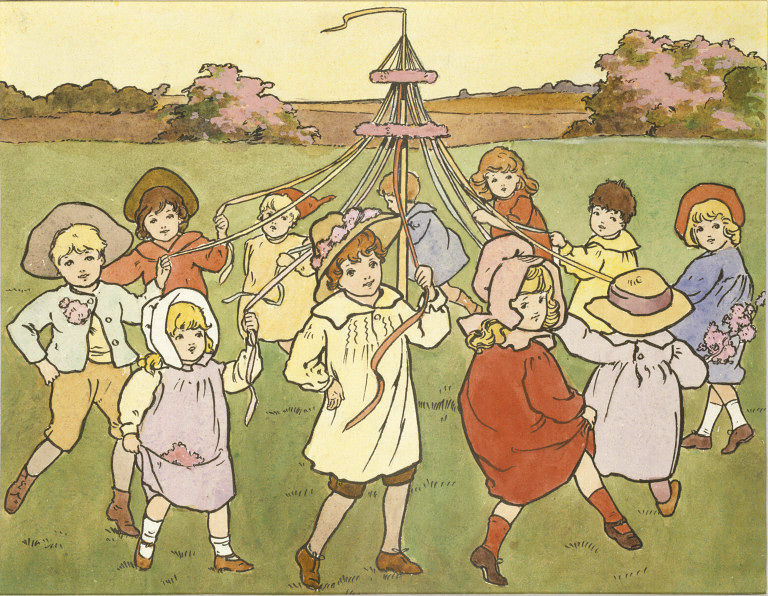 The children wear brightly coloured clothes, some wear hats. Mounted on card. Drawn by Edith A. Cubitt, ca.1900. Bequeathed to the V&A in 1970 by Anne and Fernand G. Renier as part of the Renier Collection. Watercolour drawing by Edith A. Cubitt, ca.1900; commissioned by Ernest Nister.